I held this post back for a few days so it wouldn’t appear to be rubbing salt into places where pride was so freshly wounded. But this post is about more than just the Final Four or college basketball. Sports reporters, especially in North Carolina where so many learned the basics in journalism at UNC-Chapel Hill, often repeat a myth that just has never held up to scientific scrutiny. It found its way into several stories written last night after Duke became the fourth finalist: that Duke is the basketball team people love to hate. It was so pronounced, that beginning in the early 1990s, Durham’s newly established community marketing organization used it as inspiration for one of a handful of markers as it set out to pin down and resolve misinformation undermining the community’s image. Repeatedly over the years, polls showed that Duke’s highly successful men’s basketball program was not only the most popular in Durham, but a very close second in UNC’s home county. Coincidentally, at the same time a national poll by Harris found that Duke was America’s favorite men’s basketball team, a position it has held now for 12 of the last 18 years including 2015. In the six years when it was not America’s favorite, it was 2nd most favorite five of those years, falling to third one year, 1997. The University of North Carolina was most favored three of those years giving the metro area centered around Durham and Chapel Hill a very unique status. UNC has averaged just below #3 while Duke has averaged #1. Kentucky has averaged just a bit more popular than UNC, possibly leading to a Kentucky-Duke culmination of this year’s Final Four dominating brackets across the country. But what about here in the state of North Carolina? Walking away, the newcomers were puzzled and other patrons just looked down. He may have been right about football, but probably not for long. But what do metrics show regarding basketball? TicketCity, an agency founded in 1990 by a University of Texas grad took a look at which teams scored highest for engagement in their own state, factoring game attendance, Google search and social media over the past year. Here Duke came out #1 too, in the North Carolina. 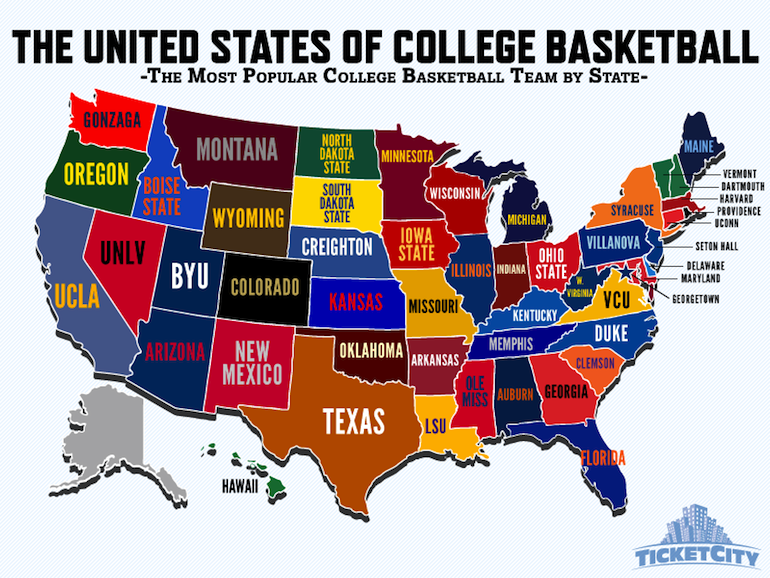 BYU was tops for Utah and Gonzaga for Washington, giving me an added alumnus trifecta. All of this does not negate that Duke might also be hated, which is a different metric altogether, just that it would be irrelevant without showing it in the context of overwhelming popularity. Sports reporters are emblematic of the challenges that face news reporters overall. Drawing anecdotes as evidence of a more generalizabe public opinion is very tricky. Local news in Durham has inferred that its recent population growth is due to the turnaround of downtown Durham in the last few years. But Durham was the fastest growing city in North Carolina throughout the 1990s when its downtown had yet to emerge and its image underwent a turnaround. How could this be? Because Durham’s self-image and its image nationwide has always been high. Over the 1990s is when negativity about Durham entrenched in surrounding counties was gradually reversed. For sure, the image turnaround by 1999 lowered one of the barriers key to downtown revitalization by opening the minds of the news media, realtors, developers, financiers, as well as newcomers. NMTC’s were recognized by Harvard in 2009 as one of the nation’s most innovative government programs leading to this 2010 case study of their dramatic success in downtown Durham. Studies, scientific polls and generalizable metrics may not be as exciting as hyperbolic anecdotes for news reports or news consumers more interested in the pursuit of legends and myths, including their own. But these tools are crucial to any community seeking a factual basis upon which to truly shift perceptions and initiate change. Studies, polls and metrics are also important when assessing which coattails to ride or credit. There is no institution more deserving of credit for everything Durham has achieved than Duke, and no program there more deserving of enhancing Durham’s reputation than Coach K’s Blue Devils. I'm from Chicago and have no college affiliations here in Durham … so I tend to say "Yay team!" for all of the local schools. I will say, however, that I don't like it when ad displays and other local sports marketing efforts show UNC, Duke, NC State and leave out North Carolina Central University. I'm not conversant with all of the various leagues, tournaments, and whatnot, but I still feel that NCCU shouldn't continue to be ignored like that. I've seen college-sports marketing campaigns at local gas stations and have been disappointed to see Duke and UNC being touted even at the gas stations near the NCCU campus. I experienced the same kind of disappointment growing up as a baseball fan (of both major-league teams) in Chicago. The coverage was very uneven. The White Sox could win a no-hitter and get a small mention in the daily paper. The Cubs could get trounced 12 to 0 but still get the huge, screaming headlines. I wished for equal treatment back then and I'd like to see it now.